← Corrine Jackson. If I Lie. New York: Simon Pulse, 2012. H. Leigh Aubrey. 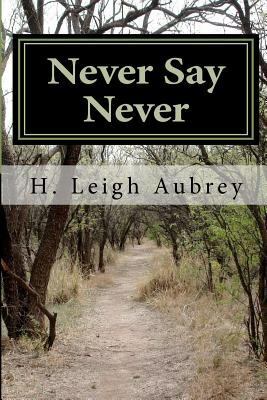 Never Say Never United States: H. Leigh Aubrey, 2011. The most important man in Brian Marano’s life has always been his father. Brian’s parents divorced when he was young and since then his father’s visits have been precious and few. In high school Brian hopes that his athletic achievements will get his father’s attention. They do get the attention of faculty, administrators, and other students at his Charlotte, North Carolina high school. Because he is a good athlete and a good kid, a teacher finds Brian a peer tutor to help him with the subjects that he struggles with. That tutor is Jason Ratcliffe, a student from a well-to-do, socially prominent family. Jason is a bit of a nerd, but well dressed and not unattractive. Brian is uncomfortable being tutored in the opulent home in which Jason lives. Jason is uncomfortable too, but for a different reason–he’s attracted to Brian and before long Brian is the most important man in his life. Never Say Never follows Brian and Jason from high school, to college at UNC, to the early years of their careers. Their friendship grows as they share the challenges of young adult life and as they come to terms, at different times and in different ways, with their love for each other.